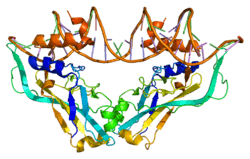 T-box transcription factor TBX2 is a protein that in humans is encoded by the TBX2 gene. This gene is a member of a phylogenetically conserved family of genes that share a common DNA-binding domain, the T-box. T-box genes encode transcription factors involved in the regulation of developmental processes. This gene product is the human homolog of mouse Tbx2, and shares strong sequence similarity with Drosophila omb protein. Expression studies indicate that this gene may have a potential role in tumorigenesis as an immortalizing agent. Transcript heterogeneity due to alternative polyadenylation has been noted for this gene. In melanocytic cell types, expression of the T-box 2 gene is regulated by the Microphthalmia-associated transcription factor. A participant in the Undiagnosed Diseases Network (UDN) with DiGeorge syndrome (of unknown cause), was found to carry the following genetic variant in the TBX2 gene: c.59G>A/p.R20Q. Research is underway to see if this change is causing symptoms in this participant. ↑ Campbell C, Goodrich K, Casey G, Beatty B (Jul 1995). "Cloning and mapping of a human gene (TBX2) sharing a highly conserved protein motif with the Drosophila omb gene". Genomics. 28 (2): 255–60. doi:10.1006/geno.1995.1139. PMID 8530034. 1 2 "Entrez Gene: TBX2 T-box 2". ↑ Carreira S, Liu B, Goding CR (Jul 2000). "The gene encoding the T-box factor Tbx2 is a target for the microphthalmia-associated transcription factor in melanocytes". The Journal of Biological Chemistry. 275 (29): 21920–7. doi:10.1074/jbc.M000035200. PMID 10770922. ↑ "Undiagnosed Diseases Network: Participant Page 001". Law DJ, Gebuhr T, Garvey N, Agulnik SI, Silver LM (Nov 1995). "Identification, characterization, and localization to chromosome 17q21-22 of the human TBX2 homolog, member of a conserved developmental gene family". Mammalian Genome. 6 (11): 793–7. doi:10.1007/BF00539006. PMID 8597636. Campbell CE, Casey G, Goodrich K (Jan 1998). "Genomic structure of TBX2 indicates conservation with distantly related T-box genes". Mammalian Genome. 9 (1): 70–3. doi:10.1007/s003359900682. PMID 9434949. Carreira S, Dexter TJ, Yavuzer U, Easty DJ, Goding CR (Sep 1998). "Brachyury-related transcription factor Tbx2 and repression of the melanocyte-specific TRP-1 promoter". Molecular and Cellular Biology. 18 (9): 5099–108. doi:10.1128/mcb.18.9.5099. PMC 109095 . PMID 9710594. He Ml, Wen L, Campbell CE, Wu JY, Rao Y (Aug 1999). "Transcription repression by Xenopus ET and its human ortholog TBX3, a gene involved in ulnar-mammary syndrome". Proceedings of the National Academy of Sciences of the United States of America. 96 (18): 10212–7. doi:10.1073/pnas.96.18.10212. PMC 17868 . PMID 10468588. Sinha S, Abraham S, Gronostajski RM, Campbell CE (Nov 2000). "Differential DNA binding and transcription modulation by three T-box proteins, T, TBX1 and TBX2". Gene. 258 (1-2): 15–29. doi:10.1016/S0378-1119(00)00417-0. PMID 11111039. Brummelkamp TR, Kortlever RM, Lingbeek M, Trettel F, MacDonald ME, van Lohuizen M, Bernards R (Feb 2002). "TBX-3, the gene mutated in Ulnar-Mammary Syndrome, is a negative regulator of p19ARF and inhibits senescence". The Journal of Biological Chemistry. 277 (8): 6567–72. doi:10.1074/jbc.M110492200. PMID 11748239. Lingbeek ME, Jacobs JJ, van Lohuizen M (Jul 2002). "The T-box repressors TBX2 and TBX3 specifically regulate the tumor suppressor gene p14ARF via a variant T-site in the initiator". The Journal of Biological Chemistry. 277 (29): 26120–7. doi:10.1074/jbc.M200403200. PMID 12000749. Andelfinger G, Etter L, Dyment M, Hitte C, Galibert F, Kirkness E, Benson DW (Aug 2003). "Radiation hybrid mapping and genomic organization of canine TBX2 and TBX4". Animal Genetics. 34 (4): 307–9. doi:10.1046/j.1365-2052.2003.01018.x. PMID 12873224. Borke JL, Yu JC, Isales CM, Wagle N, Do NN, Chen JR, Bollag RJ (Nov 2003). "Tension-induced reduction in connexin 43 expression in cranial sutures is linked to transcriptional regulation by TBX2". Annals of Plastic Surgery. 51 (5): 499–504. doi:10.1097/01.SAP.0000067964.14122.3E. PMID 14595187. Vance KW, Carreira S, Brosch G, Goding CR (Mar 2005). "Tbx2 is overexpressed and plays an important role in maintaining proliferation and suppression of senescence in melanomas". Cancer Research. 65 (6): 2260–8. doi:10.1158/0008-5472.CAN-04-3045. PMID 15781639. Bilican B, Goding CR (Jul 2006). "Cell cycle regulation of the T-box transcription factor tbx2". Experimental Cell Research. 312 (12): 2358–66. doi:10.1016/j.yexcr.2006.03.033. PMID 16730707.